I use Unity3D in combination with Vuforia 4.0.103. I search for a way to improve the recognition process for my objects. I have the impression, that the recognition of objects highly depends on the surrounding. By surrounding I don't talk about light conditions, but about objects, that are placed next or behind my tracking-object. If I put my object in front of a (bright) plain-colored background the tracking works good. But as soon as I place my tracking-object e.g. at my desk, where other stuff surrounds it, the tracking doesn't even start. I guess the features at my tracking-object are to weak, so that they get suppressed by the features of the surrounding. The tracking-algorithm does not recognize my object. Does anybody have an idea how to improve the recognition process? I can't change the object itself. I thought about 'cutting' the FOV of the device camera. So the tracking-algorithm only investigates the center of the camera-image, where my object is located. Is there a possibility to tell the tracking-algorithm to focus at a specified image area. Thanks for any suggestions and hints! thank you for your reply in advance. I think I've read all guides related to object tracking very carefully. The guides are very good so far. The guides don't mention any relation between the background and the tracking behaviour (yet). 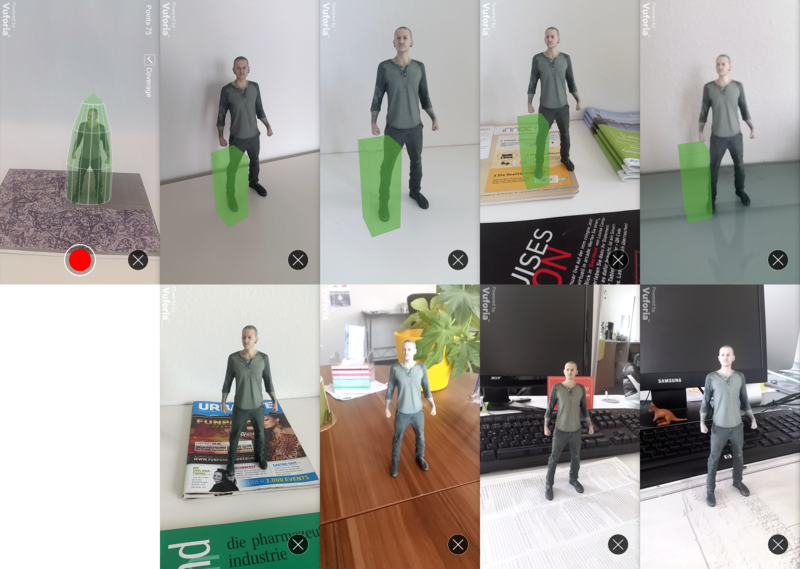 I post an image, which shows my figure in different environments and under different (but similar and good) light conditions. The figure shows only 76 relevant points, to track, which is not that much I guess. As described in my first post the initialisation of the tracking and the further tracking pocess work good, if the background of the figure is almost monochrome and bright (white or light grey). As soon as I put my object in front of others the tracking doesn't even start. I think if the tracking once started, it works good due to 'Extended Tracking' and the feature rich environment. So my current approach is to improve the initialisation process. I want to force the detection algorithm to focus on a small part of the whole camera image. Let's say a region which has a size of 300x600 pixels in the middle of the taken image. The user has to make sure, that the figure is completly in this image part and fills it as good as possible. I hope this could lead to better results, because the features, which get detected are better related to the object and not the environment. I searched the forum for similar questions. Some of them were rather old and not really promising (link) or refer to a specific platform (link). I search a solution for Unity3D. Thank you for providing all of the screenshots. That helped to explain things. For Object Reco, 75 points is a very small amount and that seems to be the primary reason the object isn't recognized in a busier environment. Similar to image targets, object targets need to have enough feature points to enable detection and not all objects will be ideal in all environments. You might try to experiment by adding some additional features to the figure to see if you can get better recognition. In regards to regional capture, Vuforia samples the entire camera view and doesn't offer you the ability to limit to a region. Thank you for the explanation. That is what I already suggested but it is helpful if some else confirms the assumptions. Unfortunately I am not able to add more features to the figures. I would ask you to leave this thread open, if I am able to find a solution for my problem, I can post it here.